I've been in an odd mood since I told Ling the story behind Tubular Bells and Richard Branson trying to bring Mike Oldfield's instrumental album to the US market. Of course the discussion went beyond The Exorcist (where the music is featured) and onto all matters creepy. Oh yes, discussions of 1970s horror movies made me think of Noodler's Ink Widow Maker for my Ink Blot of choice for this week. This is a truly stunning ink with a name that scares the baaheebees out of me. Ok, the picture of a big poisonous spider on the front of the bottle doesn't help! But it also happens to be one of my favorites with an amazing rich colour that leaps out of the page at you. This particular ink is a pink-red, but changes colour depending on the type of paper you use it on. Go experiment and see for yourself. For my money it's one of Noodler's best and is up there with Apache Sunset and Dragon's Napalm. It's not the most popular seller and I have no idea why! It's unique colour is far from boring and is sure to bring your fountain pen to life! 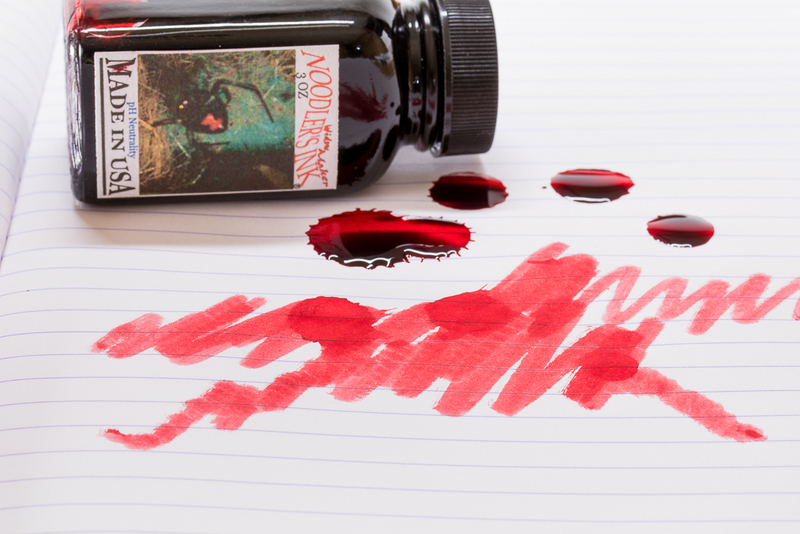 Find Noodler's Ink Widow Maker at Knight's Writing Company.